My buddy Herb Simms of Michigan General Masonry -- the contractor on this job called me to look at some beam and column components that had been severely damaged from the effects of freeze-thaw and deicing salts. The structure is reinforced concrete with massive brick in-fill walls. Some beams at the upper level have severe damage from concrete popping off because of swelling of corroded reinforcing bars resulting from moisture penetration. 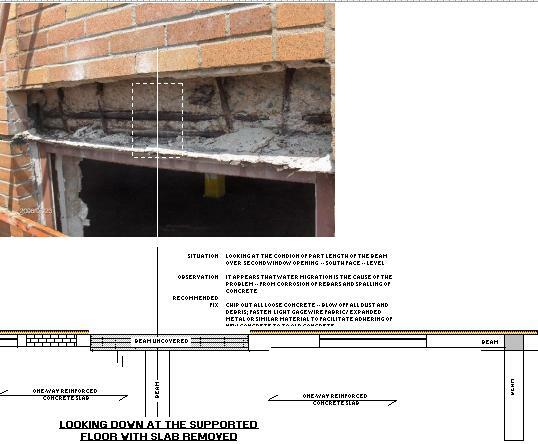 My investigation reveals that the beams support a one-way slab construction, and the vertical and lateral loading from infill brick wall. It is an older structure -- and you always have the dilemma of how far you want to go with the repair. You can not restore and renew the structure to its original mint condition. And of course you come to the conclusion that as a minimum you do enough to restore the structural integrity for safety considerations. I present here a drawing that shows the damage to the beam and a repair strategy to restore the structural integrity of the beam for safety considerations.